Murano Venini 1994 Vintage Green and blue a canne signed tall Vase Glass Spiral. 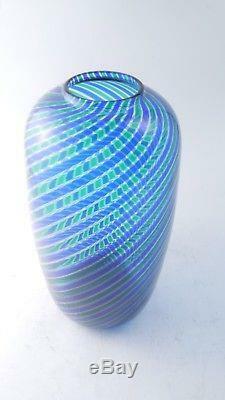 Murano Venini 1994 Green and Blue signed tall vase Murano Glass Swirling coloured. It is in near perfect condition. History of Venini: More than 90 years ago, in 1921, Paolo Venini, a Milanese lawyer, and Giacomo Cappellin, a Venetian antique dealer, founded Cappellin Venini & C. The painter Vittorio Zecchin was then artistic director and laid the basis on which the company is still founded today: reinterpretation of traditional schemes, openness towards new artistic trends and high manufacturing skills. He was able to reach all of this thanks to the glass masters of Murano island. Unfortunately, after a few years the company was split in two. The company Vetri Soffiati Muranesi Venini & C.
Was therefore founded, with Napoleone Martinuzzi as artistic director. He was one of the most important and influential people in the whole artistic world of glass. Paragraph Taken from the Official Venini Website. Please scroll down for more photos. We sending with 24h/48h DHL Worldwide Priority. Please review the images and description carefully to determine the value and condition of this item according to Buyers standards and expectations. All items and their condition described to the best of our ability and knowledge. The attached photographs are to be considered part of the description. We can send with Dhl International Priority 18 euro (20.49 USD) everywhere in the world in 24h/48h. If you need more question or photos please ask us. You will need to carefully save and send us back all the original tags, packaging and paperwork from the item. Please allow us up to 7 days from the day we received your item to handle your request. (IT) Spedizione in tutta Italia comprese isole con Dhl 11.00. (ENG) We send all over the world, for the best price possible. I can send every packet with Dhl. 48hours every where in the world. (FR) Nous expédions dans le monde entier, pour les prix demandez. (IT) Il pacco verrà spedito con spedizione tracciata. Possibilità di mettere in gruppo gli acquisti nel periodo di una settimana, basta dirmi su che cosa siete interessati e su che cosa volete comprare and che volete aspettare. Molti oggetti sono leggeri e possono essere spediti nella stessa spedizioni con un altro pacco. (IT) Se avete molti vinto molti oggetti, vi pregiamo di aspettare la richiesta di pagamento, perchè abbiamo bisogno di pesare e calcolare il prezzo per le spedizioni. Please do not use them without our permission. Non è consentito utilizzo delle nostre foto senza una nostra autorizzazione. _gsrx_vers_804 GS 7.0.8 (804). The item "Murano Venini 1994 Vintage Green and blue a canne signed tall Vase Glass Spiral" is in sale since Tuesday, October 3, 2017. This item is in the category "Antiques\Decorative Arts\Glass\Vases". The seller is "www.linomollo.eu" and is located in Bra. This item can be shipped worldwide.